MQS Quilt — will I ever get it done?! I have been so busy the past couple of weeks! Mostly just trying to do too much in a short amount of time I guess. I have been trying to get things organized and prepared for my classes at MQS, then this past weekend I taught a small group of girls from my LA Guild (who agreed to be guinea pigs) my Innovative Wholecloth Design class. We had a lot of fun, and I am anxious to see their finished wholecloths. Oh, and then of course I had to start my entry for MQS. I got my quilt marked pretty quickly, I started with just the main elements, and then decided on and marked the rest of the smaller stuff. I would normally just do the feathers freehand, but because I want the placement to be just right so the little circles on the feather tips line up pretty well, I ended up marking those in as well. 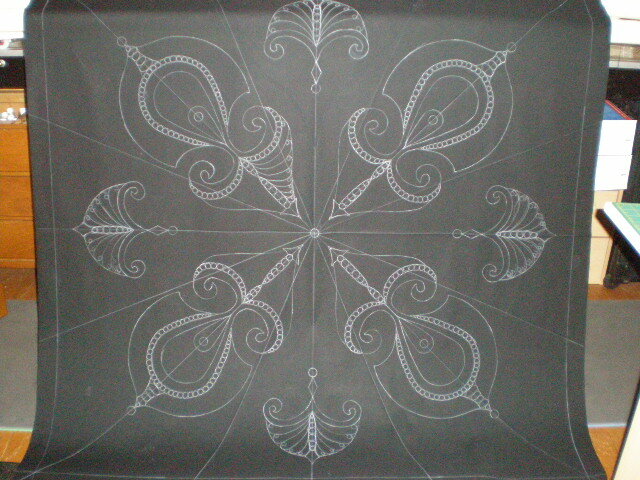 I have all of the main motifs stitched in, and am now working on my fillers. I worked doing fillers for about 4 hours yesterday, and ripping out some pebbling (yikes!!!! Especially when it’s black thread on black fabric). 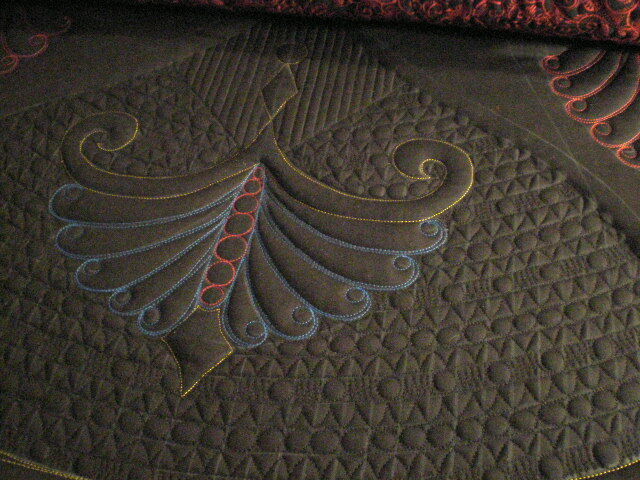 I had planned to spend today doing some more on my quilt, but woke up with a terrible stiff neck and there was no way I could quilt. Sooo, I decided to spend that time getting groceries and at least getting something accomplished (plus I won’t have to do it this weekend when W.Mart is so full I can’t even get a cart). But, at least the day ended on a good note — I found out that I got 3rd place in my catagory at Paducah for my quilt Grandma’s Clock. Last but not least, I’ll finish with a puppy pic — DH would probably kill me if me if he knew I was putting his pic on here, but it’s a cute picture. What you can’t see in the picture is DH’s shoe kinda chewed up a little <G>. 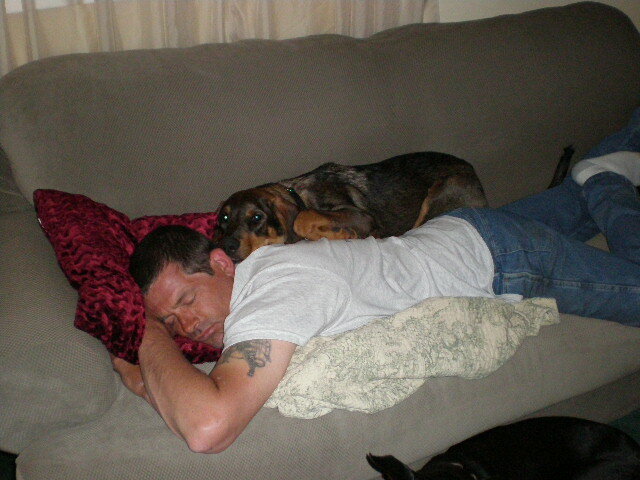 Do you believe it, he chews up his fathers shoe, and then crawls on top of him and uses him as a bed <VBG>! Absolutely breathtaking wholecloth!! Can I be you when I grow up???? 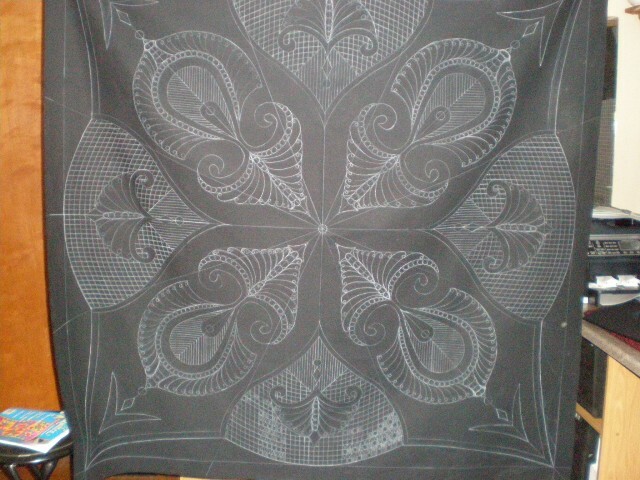 I can’t wait to see the finished quilt. So far, it’s looking amazing. 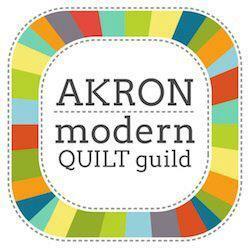 Jodi – this quilt is going to be spectacular! Can’t wait to see it finished!